Delhi is facing its highest pollution level since Diwali. The city's air quality remained in the 'severe' category for the third consecutive day on Monday as the wind speed and other meteorological factors remained "highly unfavourable" for dispersion of pollutants. Industries located in hotspot industrial areas of Wazirpur, Mundka, Narela, Bawana, Sahibabad and Faridabad will remain closed until Wednesday, EPCA Chairperson Bhure Lal said in a letter to Delhi Chief Secretary Vijay Kumar Dev. The EPCA has also banned all construction activities in Delhi, Faridabad, Gurugram, Ghaziabad and Noida till Wednesday. The EPCA directed the traffic police to deploy special teams and ensure congestion-free traffic flow particularly in identified high traffic corridors. "Concerned police department to strictly ensure that non-destined heavy duty vehicles travel through eastern and western peripheral expressways," it said. The concerned agencies have also been asked to ensure strict action against illegal industries, intensify ground action and make all efforts to control polluting activities, particularly waste burning. "The ventilation index which allows dispersion (of pollutants) is extremely poor and it is expected that these conditions will prevail for the next two days," Lal said in the letter. In light of this and the expected weather conditions for the coming few days, the Central Pollution Control Board (CPCB) task force has made these recommendations, which, the EPCA directs, should urgently be complied with, he said. On Monday, Delhi's air quality was recorded at 449 which falls in the 'severe' category, the CPCB said. Thirty-two areas in the city recorded 'severe' air quality while it was 'very poor' in five areas, it said. In NCR, Noida recorded the worst air quality with an AQI of 464. Faridabad and Ghaziabad also recorded 'severe' air quality, data showed. The overall PM2.5 level -- fine particulate matter in the air with a diameter of less than 2.5 micrometer -- was recorded at 410 and the PM10 level at 585 here, the CPCB said. Delhi's air quality turned 'severe' on Saturday. 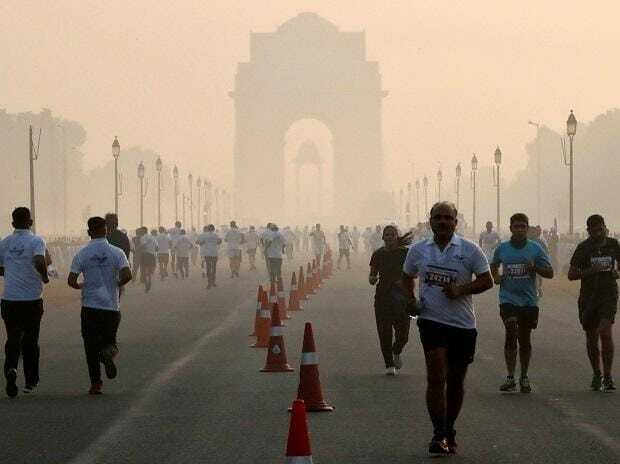 The national capital recorded its second highest pollution level of the year on Sunday with an AQI of 450. According to the Indian Institute of Tropical Meteorology (IITM), the air quality is likely to improve on Tuesday, but will remain in the upper end of the 'very poor to severe' category.